Oh my! Mangoes are a personal passion – I’d been waiting for a truly tasty specimen for an upcoming post! So nice to see such a simple, quick verision of frozen yogurt, and one that doesn’t even require an ice-cream maker. I think lime juice in the mix and lime sugar would make a lovely sprinkling on top, but that’s just because I love lime and fruit. that is really gorgeous! i often do the same with other frozen fruits like berries. yum! It seems as if everyone’s craving mangoes. Our local Farmer’s Market was loaded with really nice mangoes these last two weeks. There were even different varieties from which to choose. Great exotic taste – I’ve been making mango fruit garmishes and mango salsa. Now I’ll try your mango frozen yogurt. Yum! i thoroughly enjoyed reading this post.. after reading 2 bloggers (the other being chubbyhubby) wax lyrical about procuring mangoes from small suppliers alphonso, i really oughta get down to trying some of this good stuff. Hi Gaia – Thank you so much! This blog has been a great learning experience for me, and it makes me so happy to be able to share some of this culinary passion with others. By the way, that’s one adorable puppy you have!Hi Gwenda – You’d think it must be mango season or something, wouldn’t you! I did read Chubby Hubby’s post as well as one by Michele over at Oswego Tea – it’s amazing how mangoes inspire such passion in people. I strongly recommend seeking out some of these ‘lesser-known’ varieties of mango – you must be able to track down some great tropical fruit in Sydney! Hi Melissa, the frozen yogurt looks absolutely delicious! I have been completely hooked lately on the alphonso mangoes, –smoothies all the time! I just discovered a new mango today at my farmers market, apparently its from Kenya called a Jakal. It looks very much like an alphonso but has a pinkish tinge coming through on the skin. Have you ever heard of that kind? I think it will be ready for indulging in tomorrow.. Im very excited about it! Hi Michele – I’ve never heard of that kind of mango, but there’s a lot about mangoes I unfortunately don’t know… Let me know how it compares to an Alphonso!Hi Julie – I personally can’t imagine getting sick of mangoes, but then again I did get sick of ice cream the one summer in high school I worked in an ice cream parlour (it only took me two weeks to recover, however!). 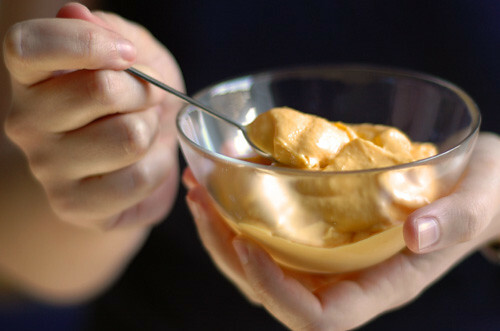 I hope you like the frozen yogurt – I love finding recipes that are so easy, yet so good. And I must say, we must be on the same wavelength, since I just bought another box of mangoes, limes and rum yesterday to make daquiris for the visiting parents-in-law!! I loved this column!see, if I were a fruit, I’d be a mango. No doubt about it – the color, taste, aroma, texture… it’s a fruit with real personality. No wonder many hindis consider it sacred.If there was such a market offering such a huge variety of mangos over here, I’d make my best efforts to make a weekly trip… even if it was in another city (me being in Jerusalem).Mango season should be starting soon here in Israel, and I can’t wait to get the first taste of Maya mango this season. When Maya will appear, I’ll try this recipe. Sounds great! Hi Malka – Thanks for stopping by! I agree, mangoes have so much personality, and every variety has its own particular taste. I’ve never heard of Maya mangoes, but the name is lovely – are they grown locally in Israel? I do hope you enjoy the frozen yogurt – it should be perfect for those hot Israeli summer days! Hi Melissa,The Jakal mango turned out to be quite nice! It was very much like the Alphonso but seemed to have a very limey tang to it. Bordering on sour but in a good way. I actually said “oh!” when I took the first bite. I rather liked it! Yum, thanks for the review – I’ll definitely add it to my ‘must try’ list! Remember those Mango Lassis we had in New Orleans? Have you figured out how to make anything like them? I’ll be ready for them as you as you come home this summer. Hello mother dear, you better believe I can make mango lassis! Have I never made them for you? I’ll have to rectify that soon! Hi melissa, a little late, but I just got to your reply….I visit this site regularly though, and I’m intrigued to see what’s new every week.Yes, Maya is one of several strains grown locally. Maya is the most popular one here. it’s very fragrant, ranging from red to orange on the outside (and bold orange within), sweet, and less fibery compared with other strains. From what I’ve heard, a quantity of Israeli mangos are also exported to Europe and the States, so maybe you’ll be able to track down and sample Maya… Anyway, I hope you will. this strain is excellent, but I just have a feeling that it would pale in comparison with those amazing fruit you described in this column. Hi Malka – Thanks for the info – I’ll definitely keep my eye out for them, sometimes the supermarket surprises me! Inspired by your recipe, I tried a version of this with coconut the other night — I can definitely recommend it! My parents and aunt and uncle are staying at the moment, and my mum picked up some mangos at our local greengrocer (she *loves* mangos). I chopped them up and froze them and then whizzed them in the blender with a tub of “Rachel’s” organic coconut yogurt, and about a third of a tub of “Rachel’s” plain Greek yogurt. No sugar needed — very, very yummy. Hi Cassie – Cool, so glad you liked it! I’ve never seen Rachel’s coconut yogurt, but it sounds delicious. I’ll definitely keep my eye out for it! Like Melissa, I have a passion for mangoes and I can’t tell you have much money I have spent trying to find good mangoes in the UK. (even bought one from Harrods for £5 and it was horrible)Most of the ones in the supermarkets are either Tommy Atkins, Kent or Keitt. But I personally find the Indian/Pakistani varieties too intense in flavour…If you are looking to try other varieties, I recommend Thai mangoes (don’t know the Thai name) which you can get from London’s Chinatown. Its sweet and has a peanutty flavour – although its difficult to get a perfectly ripe (and therefore amazing) one.My favourite mango that you can buy in the UK is called “Kensington Pride”, from Australia. The season is very very short (December to January) and I’ve only seen them for sale in large Sainsburys and at Waitrose. Its fibreless and sweet without the strong barky/oily smell you get from the Indian/Pakistani varieties.My all time favourite (unfortunately, you cannot get them in the UK) are the Manilla Super Mangoes from the Philippines. You can tell when they are ripe because they turn a rich golden yellow when they are perfectly ripe. I simply cannot express how much I love this variety. Most of them are exported to Hong Kong and Japan and they are amazing fresh, frozen or blended into drinks! I think the reason that they aren’t available in the UK is because they are very fragile and bruise easily, with a very short shelf life – but I crave them so much that I would probably pay up to £5 for one. Just bought my first Australian Kensington Pride mangoes of the season from Sainsburys. Only £1.79 each! Hi Melissa,I’m reading my way through your archives and can only wonder if you’ll ever read my belated responses to your old posts…But I had to voice my love for mangoes, and mention an interesting way to eat them. I was in Puerto Vallarta, Mexico, for a week one summer, and everyone was eating mango all over the place. They’re those huge bricks of mango that are common to the chain supermarket, only absurdly fresh and ripe — no anchors disguised as a mango here. People would just puncture the skin with their teeth, then peel away the skin while biting off chunks of fruit around the stone. The interesting thing was that everyone ate mango (and other fruit) with pepper — a cayenne-like powder sprinkled on by the fruit vendor when buying your mango-on-a-stick or pulled out of a pocket when demolishing a freshly-bought sack of mangoes.I became so addicted, that I bought an amazing lime-and-chili "topping" that was more granular than powder-y and brought it back with me to California. I would sprinkle it on every soft fruit I ate, including sweet summer plums, nectarines, and other stone fruit. I had to stop, though, because people started giving me weird looks on the BART between San Francisco and UC Berkeley. Ah, but nothing’s better than a bit of lime and chili to go with the sweet complexities of the mango…One thing my mother taught me: if you only have underripe supermarket mangoes to choose from and you HAVE TO HAVE that mango, just throw them in a paper bag with an apple, close it up and leave overnight… and hey presto! ripe mangoes! I’ve already broken down and had some of the early mangoes here in China. They look like the Manila mangoes, but have a very mild taste. Still good!And, yes, I think that the chili-lime topping included salt. 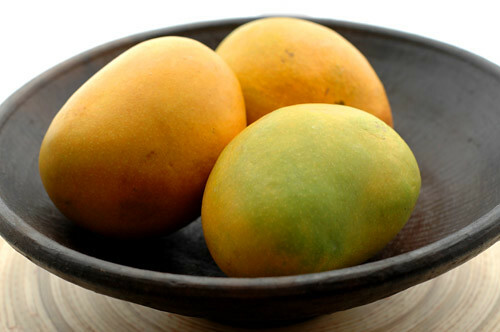 Have you tried the mangoes that are available at the Thai and Indian groceries? The texture and flavor are exquisite, they’re far less stringy, and the price can usually beat any of the variety I find in the Western grocery stores. hi again,Seasons in India can be called according to the produce found during that time and summers in called Mango Season. As many as 20 different varieties of mangoes hit Mumbai during that time and moms and grand moms make all the types of preparations form them like Pickles, Panna (cooling summer drink from Raw mangoes) and most importantly the ever favorite Aam Ras (Literally mango juice actually Mango Pulp). People make them and freeze them in ice trays and take them out to savor long after the mango seasons gone. It is quite simple to makeSeparate the mango pulp from skins and seeds. Make it a smooth thick consistency by adding cow’s milk and sugar. After the sugar has mixed well add cardamom powder as garnish. Cool it and add small pieces of mango while serving, amazing dessert after spicy Indian food.